An allergen is any antigen that provokes a strong immune response, an allergic reaction, in which the body attempts to combat a perceived threat, despite the substance being otherwise harmless. 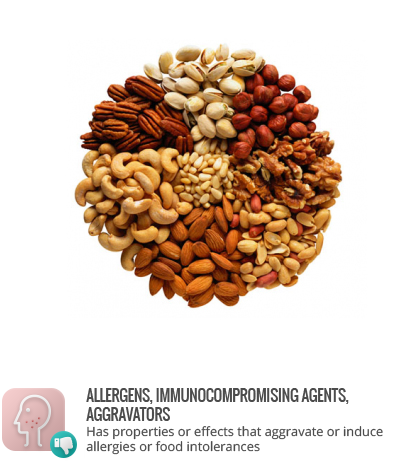 Major allergens include peanuts, tree nuts, eggs, milk, shellfish, fish, wheat, soy, sulfites, sesame, mustard, and celery. Allergens induce varying strengths of response. Allergic reactions are typically treated with antihistamines, as histamine plays a significant role in the physical effects of the reaction. Anaphylaxis is an extreme, life-threatening allergic reaction. Sensitivities vary widely, both in terms of what substances are allergenic and what quantity of antigen must be present to invoke a response. Though the allergen is present, some individuals experience a response only if the antigen is introduced by ingestion, inhalation, injection, or contact with the skin.